MOVEMENT: for ref. 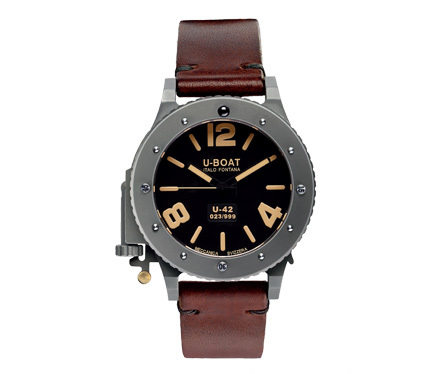 6157 and 6471 automatic mechanical, personalized to U-Boat specifications for stem to be positioned at 9 o’clock. Power reserve: 40 hours. FUNCTIONS: for ref. 6157 and 6471 hours, minutes, small seconds. CASE: in titanium, Diameter: 47 mm or 53 mm. Charge axis, stop crown lever, stop glass handles, bezel runners, andstrap pivots in steel AISI 316. Watertight on axis reset and assured charge by PTFE gasket. Bi-directional rotating bezel, in titanium, lockable with a lever on the right side of the case. Fixing of revolving bezel by 3 screws encapsulated in the back case; the bezel removal, for maintenance and washing obtained by removing the three screws, does not affect the watch watertight. 12 o’clock ball indicator on the bezel made of ceramic. BACK: in titanium, fixed on case with 6 encapsulated hexagon screws in steel. DIAL: mat black, markers treated with superluminova (peach color). Baton hands, treated with superluminova. WATER RESISTANCE: 300 mt, 30 ATM. STRAP: hand made and hand finished calf leather, carefully selected and processed following the traditional artisan handcrafted techniques used in the 1800’s, which give the strap a naturally distressed feel and look. Tongue buckle in titanium. This astonishing and exceptionally rare model was designed with a reinvented hand winder made from the same Grade-5 Titanium that was used for the back case, case and bezel. All engravings on this piece are carried out by mechanical pantograph, including the brass dial with plate located, which is galvanised and finished with a bright enamel paste. The pressure resistance of this piece is tested in an autoclave at 40 bar before the final assembly is completed. 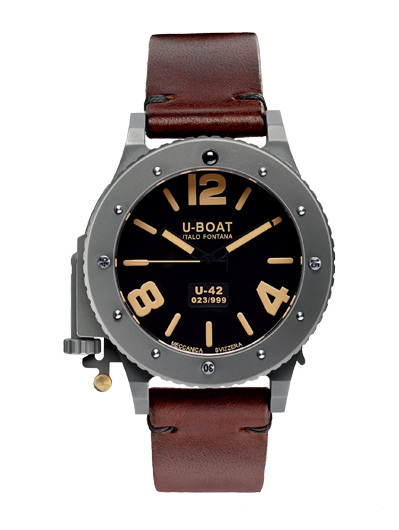 The U-42’s winding crown was built in two parts: one is attached to the movement stem whilst the other is hinged to it with a pivot. This gives a flexible joint configuration which allows the crown to protrude considerably from the watch itself for winding and setting, yet returning it to a protected, hidden position, diminishing the side clutter when in action. This type of crown is imperative under certain conditions as it is absolutely necessary for activities during which gloves are required such as underwater operations and environmental practice at Arctic temperatures. The water-tight crown protection attached to the stem is assured by a clipping gasket in energised Polytetrafluoroethylene and by an o-ring twin-arrangement.